Leading Exporter of ph meter from Mumbai. We are recognized as one of the foremost manufacturers, suppliers, and exporters of an impressive range of Medical Equipments including PH Meter. 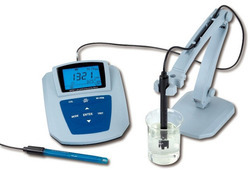 This is highly accurate and technologically advanced instrument that is capable of precise pH measurement by offering unmatched accuracy and compact design. It is capable of working in temperature range from 0 to 100 degree C and offers digital display of results. These are made by using high end technologies in our state of the art manufacturing facilities and widely used in leading laboratories for their seamless performance. Our esteemed clients can avail these at very reasonable prices.